NEW Fly Casting Techniques - by Joan Wulff. 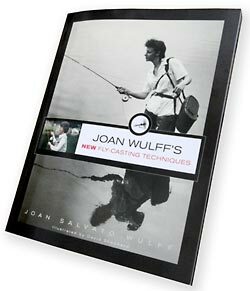 Joan Wulff's NEW Fly Casting Techniques. “As a teacher I want my knowledge to become your knowledge, to be part of your confidence when you fish. I wish I could be with you to see your eyes light up as you bring a fish to your fly by performing a casting technique you once though beyond your reach. Throughout your learning you will have your share of good casts and bad, some that are better than expected, others that make you wonder if you’ll ever get it right. And there will be some casts that are absolutely perfect! A perfect cast is a thing of beauty. If it is a long cast, it is like a note of music extended and held. In all other sports the moment of impact separates you from the very object you are projecting in beautiful flight, but the execution of a perfect cast can be seen and felt from its inception until the fly touches down on the water. I have absolutely no hesitation in recommending this book to all that inspire to improve their fly fishing or teach fly casting.